The quote came from a recent post about my feelings about people who have cockatoos. I think they are saints. I think cockatoo people are the most patient, tolerant and incredible people in the world. I could not have a cockatoo. Couldn’t do it. Why? I simply know better. I would be a withered pile of raw nerves piled into a weeping mess within a week. I wish more people knew themselves as well as I do when it comes to cockatoos. Greys? I’m good. Finches? No problem. But I am simply not cut out of cockatoos or quakers. Well, at least I won’t ever be giving one up. Read the cartoon. Then read this post so you understand how I explained my inadequacies regarding cockatoos: The No Fly Zone. Don’t get me wrong. I love cockatoos. They are gorgeous, fun, smart and charming. However, just a like a Grandmother, I prefer to play with them, spoil them, give them treats and then hand them back to Mom. I agree with every single word you said. I think they are amazing birds—who would cause me to slit my wrists in a week! Lol! 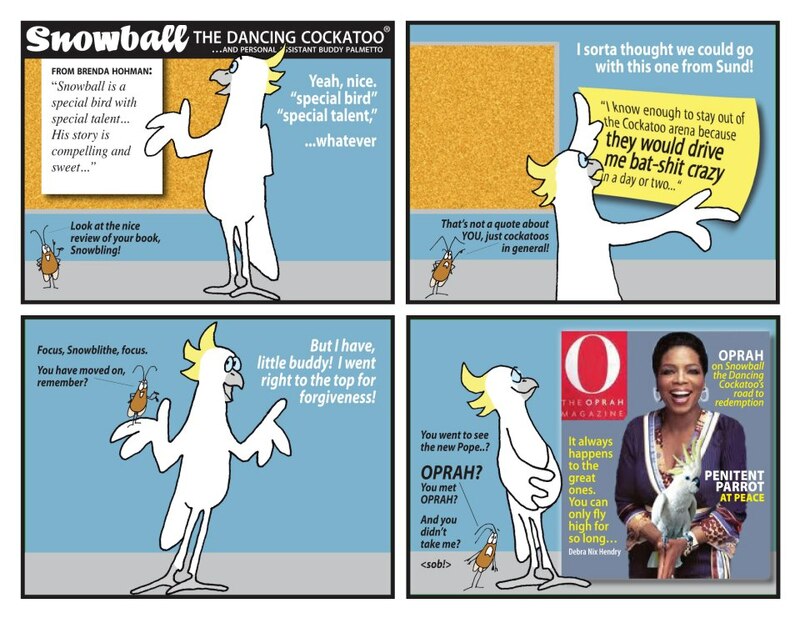 Lord, ya’ll … I need to get my eyes examined again, or stop trying to read Su’s cartoons on my Blackberry altogether — I just now saw Snowball inbetween Oprah’s arms! Birds of a feather girl, we’re just birds of a feather! Greybird is about as high maintenance as I can handle … and I do believe Irena has the right idea …. Upon reading your saga, I’m not sure if congratulations or condolences are in order. (I suspect both.) But! You still have a sense of humor. Helpful in either case. Hi Patricia, I have to agree with you on Quakers, and cockatoos. I am the Stuart to a variety of rescues and non rescued parrots. Quakers have a bi-polar personality, at least the the birds I have been involved with. One minute they are lovey dovey and the next minute their personality changes. Now cockatoos they are Velcro birds. I would also like to include macaws any, large or mini, are also very very loud and can be very annoying to anyone without knowledge or patience. My final point leads to this anyone convinced by a vet or advised by some one else breeder ect. to decrow a parrot and take its ability to vocalize is more than a crime. There should be a law to ban that practice. There are actual breeders in Arizona that offer decrowed umbrella cockatoo weaned babies so they are appartment friendly. I sent a response the the ad it was in, in an email. It was not pretty, but it worked ad was removed. Hi Bradley, I have to agree on the decrowing (I didn’t even know they did that to birds) We had a couple of dogs come into rescue that had been debarked. As for the Macaws being loud —-they are not even in the same category as the Moluccan Too. I have both and the 2 Macaws are only heard at most 2 times a day and then only a couple of hollers while the Too will scream when ever I am out of sight for the entire time. And the volume is much worse on the Moluccan. Now the smaller Cockatoos—- well I am sure they aren’t as noisy as my big boy. I was surprised at the Macaws because I had heard they were very noisy too. Perhaps I am just lucky with my Macaws.